Tremont on the Common is located on the east side of the popular Boston Common. This luxury Midtown building is walking distance of Downtown Boston, Back Bay, Beacon Hill, and the Theatre District. You’ll also be situated by the Park Street Red Line and the Boylston Street Green Line for easy transit. Additional Amenities: The building features a pool, common function room, 24-hour concierge, and breathtaking river views. Units are equipped with a dishwasher, garbage disposal, microwave, air conditioning, washer and dryer. They also offer carpeted and hardwood floors, and some have their own balconies. Contact Marsh Properties for more information about rentals and sales available at Tremont on the Common. Register to save your favorite listings as you search, and save your searches to receive updates on similar listings. 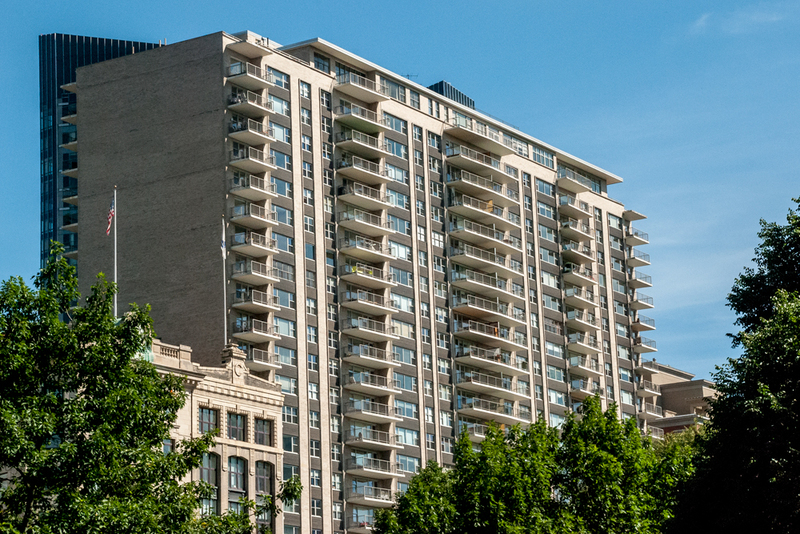 Rare opportunity for an all park facing 2 bedroom, 2 bathroom plus oversized private balcony at Tremont on the Common! This coveted two bedroom layout features 1,050 square feet of living space with an exceptional layout. Spacious living room includes space for formal dining and leads out to your own private balcony with park views. New York galley style kitchen features ample counter space as well as storage space. New quartz counter tops plus all new stainless steel appliances. Spacious guest bedroom features full wall of storage. Adjacent guest bathroom is fully stone appointed. Spacious master bedroom features space for a king bed as well as an en-suite stone appointed bathroom. Unit was just fully painted, hardwood flooring through out. Tremont on the Common features 24-hour concierge, outdoor pool, common library lounge, & fitness center. Garage parking available. All common areas to be renovated. I have a question about the property at 151 Tremont Street Boston MA 02111 (#72460309). I would like to schedule a visit for the property at 151 Tremont Street Boston MA 02111 (#72460309). Very sought after parking spot for sale for $90,000. Just dropped price $10,000. Fifth floor. This space is located in garage at 151 Tremont St at Tremont on the Common. Condo fee is $131.00/ month. Great space next to personal elevator. Very well kept garage. I have a question about the property at 151 Tremont Street Boston MA 02114 (#72325288). I would like to schedule a visit for the property at 151 Tremont Street Boston MA 02114 (#72325288). Garage parking space on the 5th floor of Tremont on the Common Condominium. Full space in self-parking garage with 24-hr attendant. Can be sold to an outsider and/or rented. Great space for someone living in he building or someone working/living in the area. Space is 88" wide, 7'4" and 17' long. The pipe above is 7' high. I have a question about the property at 151 Tremont St., Ul505 Boston MA 02111 (#72477271). I would like to schedule a visit for the property at 151 Tremont St., Ul505 Boston MA 02111 (#72477271). I have a question about the property at 151 Tremont Street Boston MA 02111 (#72485468). I would like to schedule a visit for the property at 151 Tremont Street Boston MA 02111 (#72485468). I have a question about the property at 151 Tremont Street Boston MA 02111 (#72438080). I would like to schedule a visit for the property at 151 Tremont Street Boston MA 02111 (#72438080). FULLY FURNISHED SHORT TERM RENTAL! Available June 1st. Beautifully Renovated, Furnished 1 Bedroom on the 12th floor with Private Balcony! Unit has been recently renovated and boasts a modern kitchen with a granite counter top, gas cooking, excellent storage, stainless-steel appliances and pass-through to the dining area. Large living/dining room with hardwood floors leading out to your private balcony overlooking downtown Boston. Unit offers a large bedroom with a California closet and two more closets in a hallway. Unit has upgrades throughout including recessed ceiling lights with dimmers as well as new heating/cooling units with thermostats. Unit is offered fully furnished, including all basic kitchen and bedroom supplies. Building amenities include 24/7 concierge, gym, library, and heated outdoor salt water pool! All utilities included, except cable/Internet/electricity. I have a question about the property at 151 Tremont FURNISHED Boston MA 02111 (#72484208). I would like to schedule a visit for the property at 151 Tremont FURNISHED Boston MA 02111 (#72484208). Stunning one bedroom in the heart of Downtown Boston, right across from Boston Commons. The apartment was recently renovated with modern stainless steel appliances and fixtures. Open kitchen layout flows into a large living area, perfect for entertaining! Bedroom can fit a king bed and has ample closet space. Bathroom features gorgeous subway tiles and glass shower door. Unit has Central A/C and laundry facilities on the same floor. Avail 4/15 - $3000. No pets. Tremont on the Common is a luxury 24-hour concierge apartment with an outdoor pool, fitness center and library/club room. Located near public transportation (Red, Green, Orange and Silver T lines), 10 minutes to South Station (Commuter Rail/Amtrak). Heat, hot water, and gas are all included. Tenant just pays for electricity (~$40/mo), cable and internet. I have a question about the property at 151 Tremont Street Boston MA 02111 (#72473153). I would like to schedule a visit for the property at 151 Tremont Street Boston MA 02111 (#72473153). Wow, come take a look at this sunny 6th floor condo for rent at Tremont on the Common. Spectacular Boston Common views and beyond right outside the front viewing deck. Gas cooking range & laundry on each floor. Tremont on the Common features 24-hour concierge service, resident's seasonal swimming-pool and gym, on-site dry-cleaner and on-site professional management. Tenant to pay move in fee to TOC of $250 & $150 building application fee.TOC has their own rental application which has to be filled out. I have a question about the property at 151 Tremont Street Boston MA 02111 (#72467020). I would like to schedule a visit for the property at 151 Tremont Street Boston MA 02111 (#72467020). I have a question about the property at 151 Tremont Boston MA 02111 (#72464120). I would like to schedule a visit for the property at 151 Tremont Boston MA 02111 (#72464120). Huge 1 bedroom at Tremont on the Common! Spacious and bright throughout and incredible closet space. Live in style and comfort with a concierge 24/7, outdoor salt water treated pool, on-site gym, and library function room. Rent includes heat, hot water, central A/C, and all amenities! A+ location on the Boston Common in the heart of downtown near all major public transportation, financial district, Tufts Medical, and much more. Garage parking available for rent. Amazing value - available August 1! I have a question about the property at 151 Tremont Street Boston MA 02111 (#72483902). I would like to schedule a visit for the property at 151 Tremont Street Boston MA 02111 (#72483902). Available NOW. SHORT OR LONG TERM FULLY FURNISHED STUDIO! Enjoy stunning views of Back Bay, State House, Boston Common, Public Gardens, Charles River and more, right from your own PRIVATE BALCONY! Move right in. This full service building offers 24 hour concierge, library/club room, seasonal outdoor salt water pool and fitness center. Conveniently located near public transportation (Red, Green, Orange and Silver T lines) 10 minutes to South Station (Commuter Rail/Amtrak). Heat, hot water, electric, gas for cooking are included. City living made so easy! Enjoy what the city has to offer. I have a question about the property at 151 Tremont Street Boston MA 02111 (#72474279). I would like to schedule a visit for the property at 151 Tremont Street Boston MA 02111 (#72474279). Breathtaking and panoramic park, Boston, and skyline views! Spacious and renovated interior one bedroom at Tremont on the Common directly overlooking the Common. 24-hour concierge, seasonal saltwater pool, fitness room, library/lounge, and onsite dry cleaner. Steps to grocery, financial district, Tufts Med, Suffolk Law, MGH, theaters, restaurants, and public transport. Abundant closet space including cedar closet. Beautifully renovated galley kitchen and bathroom with jacuzzi tub. Heat, a/c and gas cooking included in rent. Rental parking in heated attached garage. Note: this was converted from a studio floor plan. Cats OK. Available July 1! I have a question about the property at 151 Tremont Street Boston MA 02111 (#72483738). I would like to schedule a visit for the property at 151 Tremont Street Boston MA 02111 (#72483738).